If you carry keys, then you can always have a phone stand with you wherever you go. 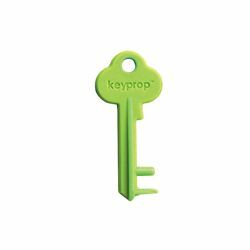 The Keyprop stays on your keyring and uses a clever design to provide a horizontal viewing angle for almost any phone. Just slip the round prong into the 3.5mm audio jack on your phone (or use the square prong in the Lightning port with iPhone 5). To adjust the angle, just slide more keys underneath!